What is it about the bee that fascinates us so? Beyond the extraordinary ways in which they live their lives, how is it that they have such a profound impact on our planet and, therefore, on us The bee is a mini-marvel of science. Putting aside that there are many thousands of species of bees, the honey bee alone is incredible. Beekeepers form a surprisingly deep bond with the bees that inhabit our hives, as a relationship that takes on dimensions not always appreciated by the layman. Yet it is illuminating to step back and consider the true wonder of the bee well beyond our own colonies. Let’s look at just a few of the many reasons that bees totally rock our world! Bees are a powerful force of nature. The minute contribution of a single bee visiting a single flower and her subsequent trips, likely to flowers of the same species, don’t change our world in any noticeable way. But extrapolate to all the bees in a beehive and that singular moment is multiplied tens of thousands of times. Extend that still further to many colonies – natural or in the form of our beehives – and consider all the regions thus pollinated. At this point the principle of “mutualism” rings loud and clear, through the miracle of pollination and the beautiful dance between bee and flower. A way for two organisms of different species to share a mutually-beneficial relationship. The honey bee and flowering plants represent one of the most successful examples of mutualism in nature. Our food chain depends very heavily on the role of the bee as it pollinates. Around 75% of native plants globally require animal pollination, much of which is through bees. A significant portion of the food we eat is on our table due to the efforts of pollinators. The economic benefits are huge, with pollinators being responsible for over $15 billion of food crops – in the US alone. It’s safe to say that the world would be a very different place without the bee. Much of the food we eat can be traced back to the simple act of a bee visiting a flower. The importance of pollinators, particularly the honey bee, is recognized not just scientifically but also by government, due to their immense economic value. The decline of bee populations in recent years was the catalyst for the creation of the Pollinator Health Task Force, in 2014. This resulted in the publication of the National Strategy to Promote the Health of Honey Bees and Pollinators. Did you know that in many places bees are “rented” as a utility, of sorts? The Californian almond industry – which accounts for the majority of the world’s almonds – needs 1.7 million hives to keep the production of almonds moving. That’s around 85% of the hives in all of the US! Almond growers can pay $200 per hive per season, as bees are brought in for the almond season. All told we’re talking about 80 billion bees or more (yes, that’s a ‘b’!). Those are the hard, cold truths of why bees are important to us, globally. But they rock for other reasons too! Pollination is a powerful force across the globe! But even locally, we benefit substantially. Many gardeners and homesteaders install beehives specifically to boost the local harvest. In many cases, this is done to brighten the garden with healthy, quickly-populating flowers. Fruits and trees benefit too and the impact can be very clear. Many gardeners choose and plant flowers to bloom across the seasons. This can help our bees, since the staggered access to blooming flowers through the spring, summer and fall extends the periods during which they can collect nectar and pollen. 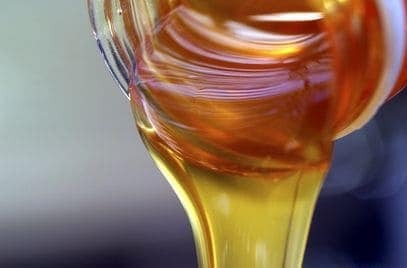 The time when bees have access to abundant sources of nearby nectar and can therefore produce the greatest volume of honey is called the honey flow. It is something beekeepers consider carefully as they plan their gardens. The honey flow is about the ability of bees to complete the creation of honey, so it also about the weather being sufficiently accommodating to allow them to visit nearby flowers and collect nectar. A period during which bees have ready access to nectar, including suitable weather, such that they can create large amounts of honey. Homesteaders, in particular, can benefit from the power of bees. This varies according to whether the fruits can also take advantage of wind pollination but, for those that cannot, the increase in yield from pollination by bees can be miraculous. It is not uncommon to see yields from an orchard grow by 50%, 60%, 70% or more when a beehive or two are installed. Aside from their pollination benefits, there is a more direct “output” from the honey bee – beautiful honey. For most hobbyist beekeepers, this is a bonus – a reward beyond the pure fascination of keeping bees. But it is clearly one of the more enjoyable aspects of beekeeping to taste pure, delicious honey made from the hard work of tens of thousands of bees. Bees collaborate in amazing ways for this purpose. Each individual worker bee has the “capacity” to produce a whopping 1/12th tablespoon of honey, during her entire life! In isolation, that wouldn’t cover half our toast! But when this level of production scales to 60,000 or more bees in a single hive, the volume of honey can be a sight to behold. The characteristics of that honey – its color, viscosity and taste – depend on many factors, but a primary influence are the flowers visited by our bees. The number of flowers necessary to produce honey is also difficult to believe. To produce a pound of honey requires in the order of 2 million visits to flowers! Just think about that for a second – two million trips to flowers, by many thousands of bees, to make that single jar of honey you enjoy over the breakfast table. A single colony can create 100 lbs or more of honey in a single year. And the cumulative distance covered by bees for that single pound of honey? Oh, about 55,000 miles! From the furious industry of the bee comes a multitude of benefits, many of which are considered to be helpful to our own health. While this is not fully accepted or proven by science, there are many who consider the health benefits of honey and propolis to be beyond doubt. Honey is a rare food that includes many of the substances necessary to help sustain life including vitamins, enzymes, minerals and water. It is also contains the antioxidant pinocembrin, which is associated with improved brain function. Bees improve the structural integrity of their hives through the use of propolis, a glue-like substance they collect from the resin of trees. Many people believe that propolis has extraordinary qualities, including helping to improve the immune system. Consider this – propolis is anti-septic, anti-fungal, anti-biotic, anti-bacterial, anti-viral and anti-microbial. Our own democracy is often front and center in the news. Yet our bees exhibit a rather pure version of democracy that is hard to believe. One of the most dramatic events in nature occurs when bees swarm. In a nutshell, swarming is the process through which a colony resolves issues of limited space. By having a significant portion of the inhabitants of the colony relocate – along with a queen – we see reproduction occur at the colony level. From one colony, springs two. A swarm is generally a sign of a healthy, expanding colony. The decision of where the swarm lays its metaphorical hat – the location to which it relocates – is one of life and death. A location too small for the storage of sufficient resources to see the colony through the winter is a death wish. Similarly, a location too exposed to the ravages of wind or with a chance of flooding is risky. To start the process of finding a suitable locating away from the existing hive, the departing bees will move to a temporary location, not far from the original location. And then something extraordinary happens. Hundreds of scout bees leave the temporary location in search of an acceptable final location, sometimes travelling several miles. They then report back and “dance” a message to their fellow scouts. The scouts then have a debate! While they may not use words or sounds we can hear, they carry out earnest communication and eventually vote in their own way. After this extraordinary process has concluded, the entire swarm will fly to the chosen location. In this way, bees leverage the numerical and collaborative advantages that nature has bestowed upon them, to collectively decide on a prime location. The process is extremely effective. Bees choose their homes very well and very carefully! This may all seem unbelievable but it is backed up by decades of research. In particular, the author Thomas Seeley has published a beautiful book that has achieved iconic status among those with a passion for bees. Honeybee Democracy * documents the underlying research in glorious detail and in a style, that is a joy to read. If you are looking for a book that truly exposes the hidden richness of bee society we wholeheartedly recommend this beautiful read. It’s perhaps awkward to call bees “pets”. This may seem a little obscure to the non-beekeeper, but once you have a beehive and watch the development of the colony, you start to care for them in a way you may never have imagined. While not exactly the same as a relationship with a dog or a cat, one builds a level of empathy as bees first establish themselves in the hive and then create and expand their home. 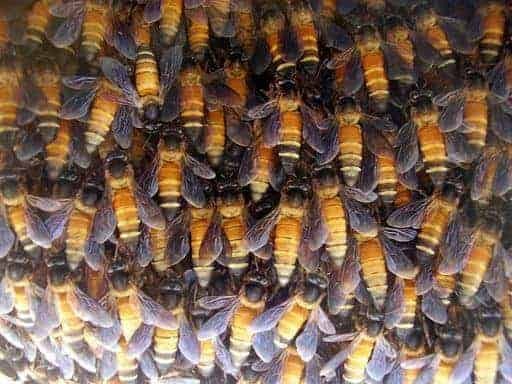 They dedicate areas of the hive to brood and workers soon establish an amazing production line, dividing efforts across the colony. Then they start foraging and building their reserves, initially to support the expansion of the colony and eventually to help see them through the winter. They face many challenges along the way and, while beekeepers may choose to give them a helping hand, they are incredibly resilient and independent. Come spring, many beekeepers witness the evolution of a relatively small group of bees (we would consider 10,000 bees as “small” – it’s all relative) as it grows through the summer to what one might truly call a hive of activity! These bees soon become more than simply a way to obtain honey. Much more. In fact, for most beekeepers honey is a secondary consideration. Over time you will find yourself truly caring about the well-being of your bees in a way you might never have imagined. After they are born, bees pass through a series of age-based roles. Bees can communicate through vibration. Foraging bees return to the hive and, through a merry dance, signal the distance, direction and quality of the resources they have located. The first job for a queen after she is born is to check for any unborn sister queens – and kill them with her sting if any exist! The queen can lay up 2,000 eggs or more per day. Larvae are each fed 1,000 times per day as they develop. Worker bees live around 6 weeks – unless they are born in late fall, in which case they can live up to 5 months till the following spring. Even when snow surrounds a beehive, worker bees inside will keep the queen at a toasty 93 degrees. Male bees (drones) don’t help around the house, have one thing on their mind and get kicked out by workers, to die, in fall. And finally, we humans can learn a great deal from the ways bees act. Their collaboration across the colony is legendary. From birth to death, each worker bee has a well-defined role, which changes as she ages. From the nurse bee to the forager, the productivity of bees is amazing. They do this with no infighting (unless you are a drone in the fall! ), with ways to communicate bordering on the miraculous and a willingness to give everything for the benefit of the many. These characteristics and behaviors result in a society that is incredibly effective and efficient. They build their own home, they protect each other, they gather their own resources and they survive long, hard winters from these very same resources. It’s true – bees rock! * This post may contain the occasional affiliate link, which can help us earn a small commission to keep our site running, at no extra cost to you. Thank you! We are on our way. This first section was written in an easy,fun way. Can’t wait for the next section. I am all in with beekeeping ! So exciting! I am totally intrigued!! What an amazing lesson, can’t wait for the next lesson! Glad to finally start the course, been looking forward to learning all I can thanks for putting this together. very easy to read and well written. to the point. Thanks, looking forward to more and more. This is a perfect set up the Winter months (can’t garden), and a bit at a time fits in with a busy lifestyle, yet an easy enough commitment. Im glad we are finally here at this point i have a 5 acre garden that is certified organic and ive been wanting to get into bees these coarses will help me out to get started with my hives this spring. Thanks again for putting this on. Bears Den Organic Produce Inc. Thanks so much, I have been a beekeeper for 5 years now but saw your offer for the class and thought it would be wonderful to offer to some new members of our honeybee association or to students to get them going. I am 78 years old and raised bees when a child, then grew up and traveled most of the world in the USAF. After retiring in 1979 I have worked numerous jobs two being a retail supervisor and then a nursery owner/operator. When I finally sold the nursery I wanted to get some honey bees. Well here I am and really enjoying learning after these 5 years and will hopefully teach your course to some newbees the remainder of this winter and comming summer. I am thrilled at the thoroughness of the course and will let you know how it goes. I am now building myself a 8 frame extractor and an oxalic acid vaporizer and having fun, fun, fun. Thanks again, John. Thank you so much for the comment, John. You have a wonderful story and it’s very kind of you to share it here (and thank you, of course, for your service). It is thrilling to hear that you have enjoyed and found value in our course. I hope you enjoy the rest of it too. While we would, of course, ask that you don’t simply copy / distribute our course directly, if you are able to refer your students to the content we would be very appreciative and do hope it helps. Please keep us up to date (especially the fun side of things, as you mention!). Great intro to beekeeping, I’m really looking forward to learning more. I’m hoping to start beekeeping this spring to help with my new vegetable production business. This is something I have been very interested in all my life. And now as a grandmother my grand daughter has been begging for us to do this. So here we go. I was going to go ahead and buy a hive, equipment etc. but have decided to go through this course first to make sure I make the right choices. Thank you so much and am looking forward to learning all I can. and of course my granddaughter will have to take this course also. amazing!great first start, new facts and interesting links thanks for everything! As a complete newbie, I want to thank you for this wonderful treasure trove of information. Just when I think I might know a little about those fascinating little creatures, along comes something new. Just retired and do a lot of Organic Gardening. Supply food for many of my neighbors and friends. Wanting to get better production and yields in the garden. Been reading and learning about bees. Going around and learning about bees through the local beekeepers. This website is great learning. Looking forward to getting my first two hives this spring. Will be a frequent reader of your information. Thank you for providing so much valuable information. Great read! This should be in a High School Biology class, I wish it was in mine. Great first post and quite interesting tidbits. Somehow I hadn’t noticed just how many eggs a queen could lay in a day. That is incredible!! Thank you sharing this fascinating introduction on the importance and diversity of bees. I look forward to reading the next set of materials! When I was a kid, I went with my grandfather bee hunting!! I have his “bee box” and “smoker” still!!! It was fascinating!! I am truly enjoying your course!! Thanks for all the amazing facts! Wow I’m so amazed by bees just reading this first lesson can’t wait for next! Can’t wait for the next article. I am a first year newbie, and I love my girls. Can’t wait to start beekeeping. Love it even more! I have bees. Hope to learn more about them. Have been fascinated w bee keeping since I was a child. Truly amazing creatures. I am a Texas Hill Country new beekeeper. With the varied climate, storms, drought, I am continually interested in learning more about these bees. This is a great place to learn about bees and a great place to purchase needed supplies as well. I look forward to each day’s news! Thank you! I am so happy that we have started this course. I have been beekeeping only since April. I had 3 hives and lost 1 to waxmoths. This has been so fascinating, however I’ve made so many mistakes. Hopefully with what I learn now, I will be able to successfully winter my other 2 hives and next year I will do better. Thanks so much for presenting these articles for us. Thank you so much for offering this class. I have been a hobby beekeeper for a total of 4 years and now just retired from the military and hoping to expand my hobby of keeping bees. I could not control my urge to share the small amazing tidbits of information of the bees with my family, hope I’m not driving them crazy. This will make me a much better beekeeper. Bless Ya! Very good read. I came across this lessons on the day it started. Learning it all form Koru, Kenya -Africa. Intending to start my Apiary in January. Lots of bloom then…. Can’t believe I’m beginning to understand honey bee – this is wonderful! Thanks for this course! I’m learning so much already and look forward to the next chapter. Ready to learn! Thank you for this course to help us help our bees!!! Looking forward to learning much much more! Living in Western PA, we have an apparent shortage of honey bees. We have lots of bumble bees. Will they coexist well enough? In our rural setting the goldenrod is prolific. I am recently retired and hope to start this new adventure. A big problem might be the black bears in our neighborhood. Looking forward to how best to deal with them in future articles. What a nicely put together post covering the many reasons bees rock, are amazing, and my new favorite creature. I adore my bees and I get very upset when I’m away from them too long. And I really dislike discovering bad news. It is amazing the amount of work they do for us. Pollinating flowers (my favorite thing as an avid gardener!) is just one of many things they do for us and ways in which they provide for us even though they really have no way of knowing they are doing so. One season as a beekeeper and I’m hooked. What a great source of information, thank you I can’t wait for more. I’m planning for my first hive to be a flow hive this next spring. Thank you for providing this wealth of information for free. I too will start 2 hives this spring. I am extremely excited! Hello, We have been beekeepers since April 2017. We got 9 healthy hives. Hope to learn more about my bees. we are loving our bees. They have become our family. Its been fun. The honey is all organic. We don’t feed them sugar water. We got 17 acres a pond for them. Lots of wild flowers. I plan to plant seeds this February coming up such as Lavender, mint, sunflowers and others flowers for them to enjoy. The honey we extracted in June was thick and tasty. Yummy!! Getting a late start but catching up!! Thank you, off to a great start as a new future bee keeper. Looking forward to reading more. Thanks for all the hard work you’ve put into developing this free course. First article looks great, and the info included is helpful. Looking forward to continuing on and setting up my first hive in the spring. Love the way this is written. Gets to the point fast and is easy to understand. Thank you for the great information. My dad had always had bees, so I thought he would be my mentor. But he was diagnosed with Acute Vascular Dementia/Alzheimer. So didn’t learn much before he moved in with me. Loved this section, should be read by everyone due to the unbelievably fascinating content; can’t wait to further my studies in bee culture and to hopefully one day become a beekeeper myself! I’m so happy I found this course!! Can’t wait to go through the rest of the material. There will be stumbles, but those stumbles are the best learning experiences. Always love to learn more about bee’s and beekeeping. I am currently on my 2nd year and learn so much every time I get into my hive. Just amazed at how I did not discover this sooner. Bee’s do indeed Rock! So much to learn about taking care of bees! Wow, so much to learn. They are quite amazing. Awesome information very well explained and easy to read.. This opportunity to learn about Bees so far is becoming addictive already. 1st year at bee keeping, looking forward to learning all I can. Thank you for a very interesting course! I appreciate you offering it to all of us who are wanting to learning more about these fascinating “pets” as they are referred to in the first lesson. So excited to find this online program to get educated on bees, looking forward to a retirement on family farm and begin beekeeping. Thank you to powers that be goroffering and making availanle. I have had bees off and on for over fifty years, but still, have a lot to learn. I’m so glad to have signed up, and looking forward to begin my own bee hive! Where in my backyard would be the best to place them? I’m happy I found this course want to know everything I can. Just opening up the hive and taking a look inside can be very intimating. Great first article! Can’t wait for the next! Hello, I just began read section 1 of several of the very insightfull and educative series you offer, thank you for doing so. As I began, the concise and well written text is helping a lot with what I’ve been learning about bees , specifically honeybees so far. Reading and learning fro those various texts is that it is better to prepare one’s patch of landgarden growing flowering plants, shrubs and flowers so that the honeeybees as you so vividly wrote is the astonishing distance those short-lived creatures that are (a) one honeybee gather barely half a tea spoon in its lifetime, and that a colony of such honeybees have to fly about 55,000 miles to gather the flowers’ nectar in order to produce a pound of honey. … if a bee wouldcopuld live lnger it would take that honeybee the equivalent to 12.3 times Earth-Moon distance of flight to produce that same pound of honey … i am in awe … and trust i am understanding more profoundly what the section about “mutualism” – All are to thrive as each of the parts thrive as harmoniously as possible and as naturally as It is created. This article is very informative and yearning for more . I LOVE READING THIS THROUGH THE WINTER!!!!!! !I HAVE LEARNED A LOT!!!! Wonderful information; I’m eager for more! Wonderful information. Thank you for this lesson! Bees do rock! I’ve been reading other books like Beekeeping for dummies and The back yard beekeeper. The information that I’ve just read is the same information I’ve read in those books. Can’t wait to learn more.